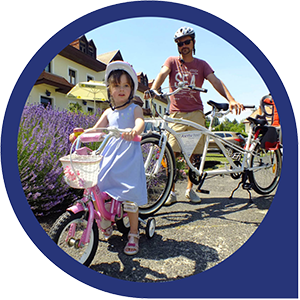 Whether you want to have a pleasurely family ride or cycle around Lake Balaton, our clean and well-maintained bicycles offer a great experience. Rent bikes from us! Are you looking for a memorable experience by Lake Balaton? Step on board, sail with our captains and discover the Hungarian Sea or rent small sailboats from us! The breathtaking scenery of the Tihany Peninsula holds many amazing sights. We can show you unforgettable natural and cultural treasures on our guided tours! Our active tourism agency, Aktív Pont Tihany offers bicycles and small sailboats for rental, pleasure sailing, guided walking and cycling tours. Our aim is to contribute to the memorable holiday of anyone visiting the Tihany Peninsula. 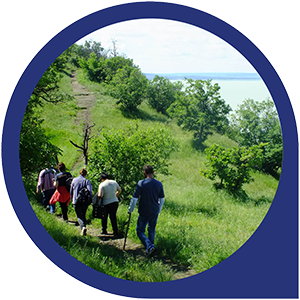 As locals, we know the unmissable sights of the region and proudly present the unique scenery, history and traditions of Tihany and Lake Balaton. We believe this area worths a visit for anyone travelling to Hungary and offers unforgettable experiences. We are in a perfect location, in the gateway of the peninsula: the bus service between Tihany and Balatonfüred runs in front of us, parking is free for our guests. The Balaton Cycling Path is next to us and our sailboats leave from our private port. I rented a bike for 3 days at Aktiv Pont Tihany and everything went perfectly! Adam, the manager of this place, is really competent and friendly. When you rent a bike, you also have everything included for your security and comfort (helmet, bags, pump, lights…). Adam will give you all the advices you’d need for your trip. I highly recommend Aktiv Pont Tihany if you have to rent a bike in this area! If you are coming by car on route 71, take the first exit from Balatonfüred direction (last exit if Keszthely direction). You will shortly pass the Tihany sign and after about 300 meters arrive to our office, which is located by the entrance of Aquilo Hotel Panoráma. The ferry six kilometers away offers a quick connection to the southern side of Lake Balaton and M7 motorway. Parking is free for our guests. If you are coming by bus from the village of Tihany or from Balatonfüred, get off at the stop named Hotel Panoráma. The bus stop is right in front of our office, just like the Balaton Cycling Path. Our address is 8237 Tihany, Lepke sor 9-11.